How Much Does It Cost to Create an On-Demand Delivery App? The popular on-demand Uber concept can be found today in various domains, from groceries to healthcare. However, it’s not enough just to duplicate this concept in another business niche. It’s important to consider lots of factors, as there are many pitfalls associated with on-demand deliveries. Last year, two industry giants, Shyp and Uber, both failed with their on-demand package delivery businesses. Shyp ended up closing their business, while Uber shut down their UberRUSH merchant delivery service. Both UberRUSH and Shyp were based on the idea that lots of people don't mind paying a premium to receive goods fast. This assumption lured the companies into a trap, as consumers want fast delivery but aren’t ready to overpay for it. It seems that fast delivery to give retailers a competitive advantage is unlikely to become a profitable independent business model. Uber learned a hard lesson and transferred their experience to UberEats. This product is now the fastest-growing food delivery service in the US. It’s profitable because of the agreements between partner restaurants and the UberEats app. 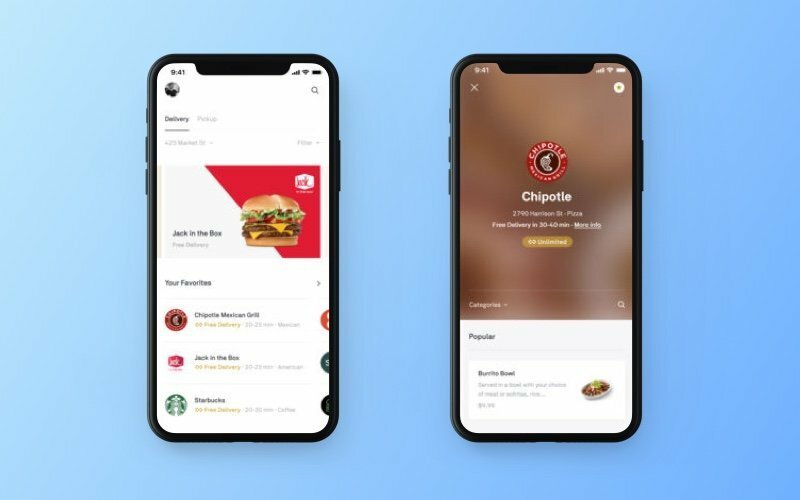 When a customer places an order via UberEats, partner restaurants share about 30 percent of the order value with Uber for marketing their food. In addition, UberEats services are in higher demand than UberRUSH, as food delivery has constant demand whereas demand for sending items is inconsistent. In this article, we’ll discuss approaches to on-demand delivery app development and look at the cost of building this kind of app for both the Android and iOS platforms. But first, let’s define what “Uber for delivery” actually means. 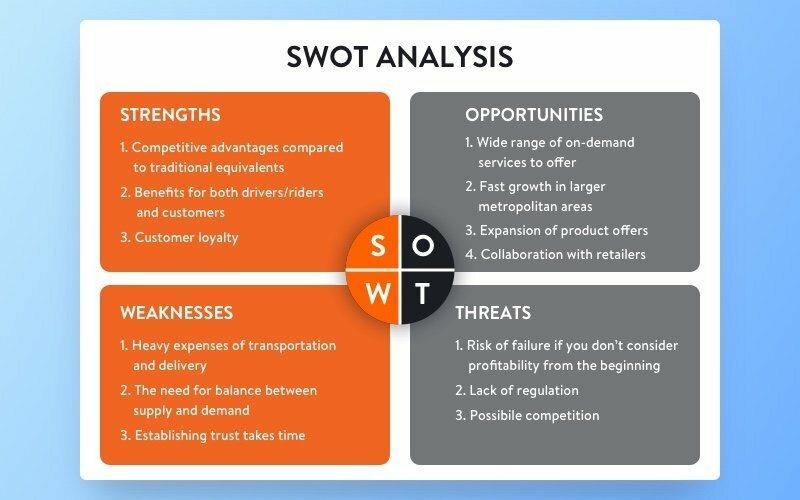 What characterizes on-demand delivery marketplaces? Package delivery. The failure of companies such as Shyp, Uber, and Doorman shows that they should have provided sufficient density, as sending a driver to one pick-up location often isn’t enough to cover the costs of delivery. Examples of successful package services that have managed to solve this issue are Roadie and Hitch. 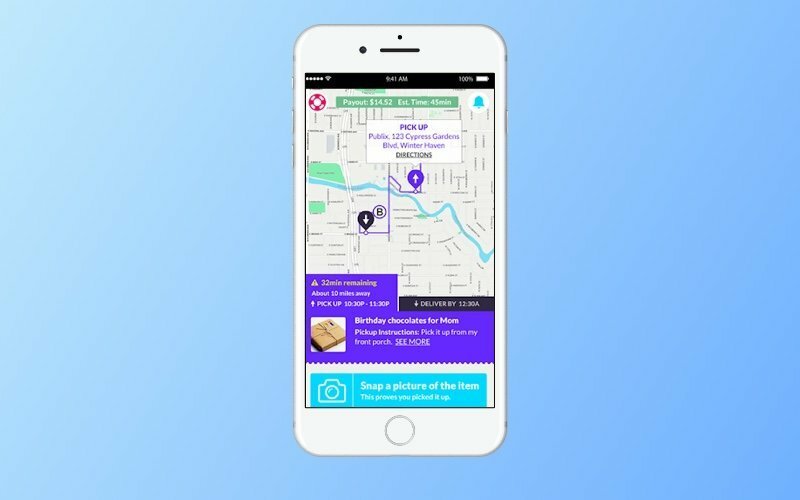 They provide crowdsourced delivery services through people who are already heading in the direction of the delivery instead of by sending a driver. The Roadie and Hitch mobile apps allow users to enter their daily and planned routes and then matches them with deliveries. This strategy helps the companies save money, as they can pay their drivers less than a conventional courier service. Local food and grocery delivery. Examples of food and grocery delivery include Instacart and Postmates. Instacart focuses on grocery delivery. They hire personal shoppers (contractors) who purchase and deliver products to customers. Postmates delivers groceries and other on-demand goods with the help of their own delivery people. Delivery for retailers. Since much online shopping happens on smartphones and tablets, some of the biggest retailers have also jumped on the on-demand delivery bandwagon. Amazon, for example, offers same-day delivery to Prime customers in more than 10,000 cities. There are also a lot of startups that develop on-demand delivery apps specifically for brick-and-mortar retailers. Deliv, for example, uses independent contractors to deliver goods from stores and malls for a fee. Deliv partners with Adidas, Sony, and other popular brands to solve their last mile problem. It’s a win-win solution for both sides, allowing a retailer to reach a larger audience and the delivery service to grow its user base much faster. Yalantis developed the Move on-demand delivery app. This transportation app connects delivery providers with customers. You can check out the details of this project here. To make your app successful, you need to identify and track the most important KPIs. For a mobile on-demand delivery service, you need to consider three things: user acquisition, user retention, as well as transportation and delivery costs. Start locally.When starting a business, it’s usually easier to start with smaller investments. In the on-demand market, this means that you should test your concept in a limited geographical area with a dense population. This will make it easier for you to enroll and mobilize drivers and grow your user base without slowing down the service. Make sure to advertise your service even before launching the app.You should use all promotion channels like social media and practices like public relations. Another great idea is to acquire users through a referral program in your app. With referrals, your customers can invite friends to use the app and get a free delivery in return, for example. Collaborate with retailers. This is a great way to grow your user base because the retailers have already done the hard work of acquiring a customer audience. This is how Instacart and Postmates began. As a startup, you can collaborate with smaller retailers, but as you get noticed, larger retailers might also be interested. Postmates, for example, recently started working with Ford and Walmart to deliver goods with self-driving vehicles. Retention applies to both customers and contractors. Of course, you want your customers to keep using your service. But to be efficient, you’ll also need to keep your service attractive for contractors. We’ve gathered some strategies that will help you keep up your retention rate for both customers and contractors. Great customer support: Customers should receive quick and friendly responses to inquiries or complaints. Customer support should be easily accessible from the app. Actionable rating system: After a delivery is completed, customer feedback is crucial. Listening to feedback is a great way to innovate. Just keep in mind that it’s important to react to feedback to keep customers happy. For example, if an Uber driver receives too many low driver ratings, their account is suspended until they pay for an Uber training session. Include a rating system in your on-demand app. Contractor screening: Screenings can include background checks, video interviews, driver’s license verification, insurance and registration checks, driving history checks, and proof of a dependable vehicle. Special offers: Customers will want to use your app again if they can get discounts, vouchers, or gifts. These special offers can be implemented via loyalty programs. You can, for example, give your customers higher discounts if they use your app longer. Retaining customers is only one part for this KPI. The other part is retaining contractors. Here are four strategies for retaining contractors that you can use if you’re building an on-demand app. Rates: What contractors get paid may vary, and mostly depends on location. In order to keep customers, it’s important that the price for an on-demand service is low. For this very reason, a contractor’s rate is usually low for an on-demand startup to stay in business. For example, Postmates drivers earn up to $25 per hour during onboarding. However, currently the actual average wage is around $9 an hour. Uber drivers tend to earn more than Postmates couriers. Nevertheless, Postmates keeps growing as it provides a great alternative for those who can’t work for giants like Uber because of specific requirements. Flexible work schedule: One of the reasons why on-demand services are attractive for contractors is because of their flexible work schedules. When contractors can schedule their work hours as they want, they get a certain freedom. Covering transportation expenses: Even an attractive rate may quickly be eaten up if contractors have to personally pay for vehicle and gas expenses. You might want to consider subsidizing gas and transport costs. Other sources of motivation: There are many ways to motivate contractors. Uber, for example, offers free tuition at Arizona State University Online for their platinum and diamond drivers. Uber also has a rating system that allows drivers to rate their customers. This way drivers can avoid low-rated customers if they want. Synchronize routes. The delivery model adopted by Roadie and Hitch, using drivers who are already headed to the destination, allows these on-demand delivery companies to save money. Roadie drivers earn from $8 up to $650 per job. Earnings depend on the size of a package and the delivery distance. Roadie gets its revenue by taking an approximately 20 percent cut of each gig. Limit the delivery radius. Setting specific delivery areas for couriers also enables businesses to optimize delivery expenses. A limited radius saves fuel and reduces vehicle wear. For instance, Deliv provides their couriers with deliveries within 15 miles. Energy-efficient transport. One more option to save on the cost of delivery is to attract bike riders. Postmates recruits bike couriers to deliver small packages. This job opportunity is in demand as it’s a great fit for students looking to earn some money. Delivery by bike cuts costs, as bike maintenance is much cheaper than car maintenance. Now that we’ve addressed KPIs, let’s take a look at the basic features that your on-demand app developers can implement. 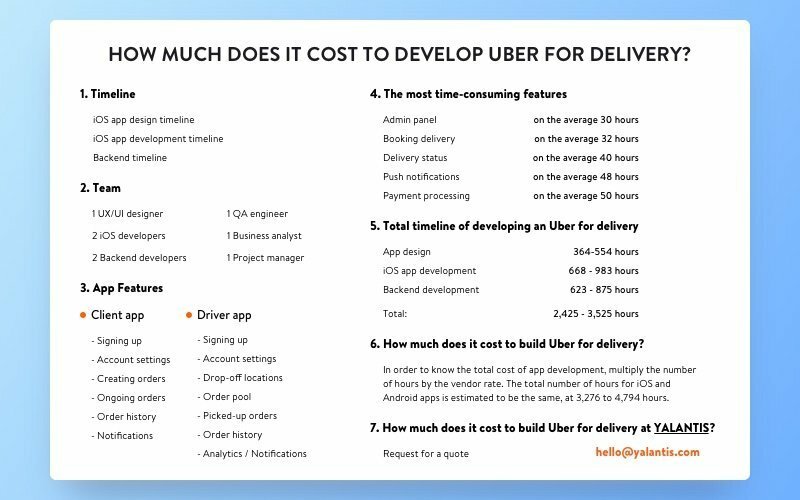 How much does it cost to develop an on-demand delivery app like Uber? We calculated the cost for an average on-demand delivery app. Below are the hours that go into design and development for iOS and backend development. Start locally. It’s easiest to start in a small area with a dense population. This will make it easier to recruit contractors, advertise, and test your concept. After you’ve acquired some users, you can operate on a larger scale. Promote your app before launch. This can be done through social media, offline advertisement, or referrals. Earn trust. Establishing trust is important for an app’s success. You can create trust by enabling contractor ratings and reviews, screening drivers, and offering customer support. Make your contractors stay. Retain your contractors by making it attractive to work for you. Making it attractive to work for your service might mean offering competitive rates, flexible schedules, reimbursement of transportation expenses, and other creative perks. Think of profitability beforehand. The costs of delivery are high, so make sure your business model allows you to cover them. Prosperous apps like Roadie and Hitch, which use couriers heading the same way as the delivery, and UberEats, which has agreements with partner restaurants, are good examples of effective business models. Even though an on-demand delivery business requires a balanced approach to achieve profitability, chances are you’ll build a successful app if you consider your predecessors’ mistakes. Start small and gradually scale your business. Think about how you’ll minimize expenses and ensure a sufficient number of couriers. Hiring a professional development team is one of the key aspects of your project’s prosperity. We’ll happily make a contribution. We have everything you might ever need to create a mobile solution that can attack the market and win.